When: Friday, June 24, 2016 – 12:00 p.m. to 2:30 p.m.
Start the party with lunch at Sardina’s Italian Bistro. 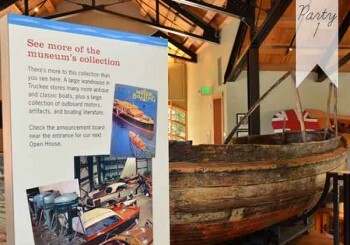 Then travel a short distance to Tahoe Maritime Museum’s Reno storage facility. Curator Barbara Bogucki will lead a private tour. You will view 30 antique boats from the 1920s through the 1960s. Learn about their history and importance to the Tahoe area. Learn about the difficulties of curating an artifact that is both wood, requiring a humid environment for preservation and metal requiring a dry environment for preservation, as you tour the collection.